Introducing the Hallerklammer....the highly sought after range of intraoral clamps from Kentzler Kaschner Dental. This is great news for loyal fans out there who have previously struggled to obtain them; as Optident have won the privilege of introducing the multi functional tool to the UK market. The Hallerklammer is the latest addition to the Kentzler Kaschner Dental range, and was specially designed by Dr Landenberger. Pair this with the black rubber dam, also from Kentzler Kaschner, and you have a perfect combination, providing a fantastic backdrop for photographing your restorative work. Officially known as the Hallerklammer 2A, this multifunctional tool is designed to easily retract the tongue and cheek whilst eliminating moisture contamination. It is ideal for many uses, including Cerec work. Featuring a housing that sits around the molar and two low seated arms positioned either side of the mandible or maxilla, rubber dam or cotton rolls are kept snugly in place. The upright ‘fingers’ on the Hallerklammer act as a clip, securing the saliva ejector tube and freeing up hands. Utilising orthodontic bands onto the teeth, on the side of each arm, the gingiva or rubber dam can be retracted; the elastics pull apically against the coronal force of the rubber dam frame. During second molar restorations when a rubber dam clamp is virtually impossible, clever tricks such as using X-ray film upright in the fingers are a great way to create a tongue barrier. "This multifunctional tool is designed to easily retract the tongue and cheek whilst eliminating moisture contamination"
The Hallerklammer can be secured with floss in two ways for the patient’s safety and your peace of mind. Place easily with forceps that insert into the top holes adjacent to the ring and release when in place. The attractive light gold colour option of the Hallerklammer and family is the tougher than steel zirconium nitride coating.All other colours are a titanium nitride; both are used often in the coating of medical devices such as scalpel blades, bone saw blades and implants. A range of sizes and colours of Hallerklammer clamps are now available from Optident. 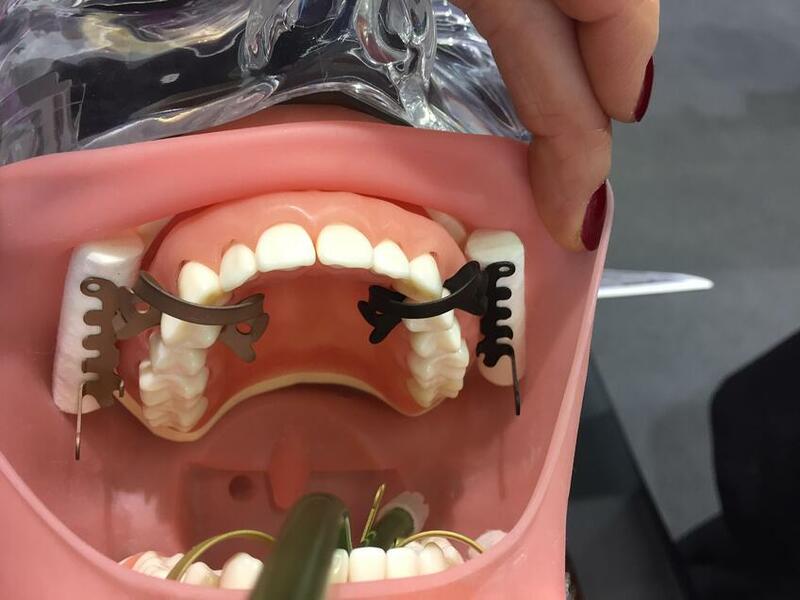 The 2A, sometimes referred to as the ‘Hallerclamp’ and the black rubber dam, is already generating interest among dentists and key opinion leaders of restorative dentistry.